Fun wouldn’t be the same without all the great friends we have made along the way. Our time in North Georgia was filled with friends and family…what a blessing! Rick and Jennifer came up to their cabin in Blairsville, the second week in April, and we had a great time with them. They came over to Cleveland to check out our camp site, and then we took a ride, to Helen, along with some of our Paradise neighbors, Bruce and Teri, and Brian and Lynn. We had a great lunch at the Old Bavarian Inn. 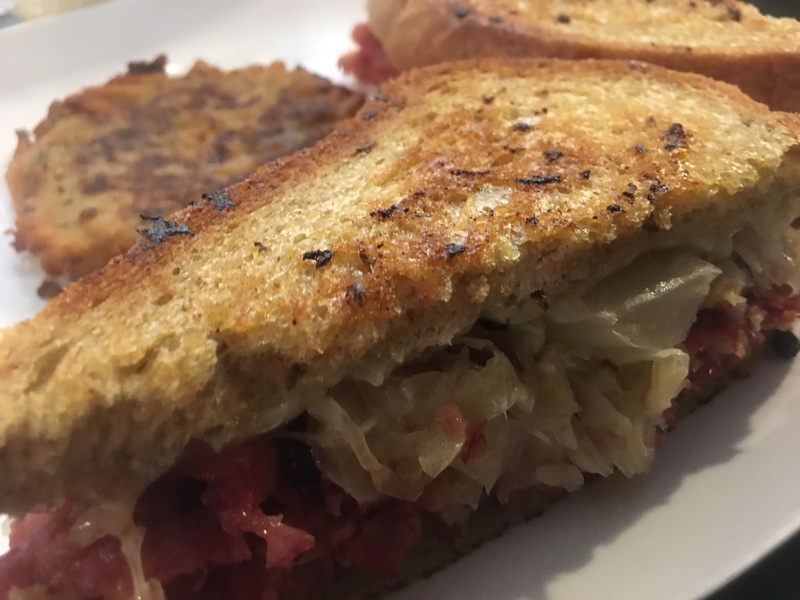 I look forward to their Reuben sandwiches any time I can get one. However, this was not the highlight of our afternoon. It seem that a certain someone forgot the key FOB for his motorcycle. It is possible to start your bike if the key FOB is nearby (say hanging on the hook in the camper) and then one is able to drive far away from their key FOB. It only becomes apparent that one has made such a mistake, when, upon shutting down the bike, they cannot start it up again. There is another way to start the bike, if a security code has been set up. Everyone was hungry, so over lunch, a security code was searched for in the owners manual, phone calls were made, and Iphones diligently searched. To no Avail. NASA we have a problem. I’m not going to name any names, but dessert on this ride was humble pie. The guys went to retrieve the key FOB, while the ladies did some shopping in Helen. Fortunately, Helen isn’t that far from Paradise Valley R.V. Resort, so once the key FOB was retreived, we still had time for a great afternoon of riding. Sunday afternoon ride through the mountains of North Georgia. Hanging with Rick and Jennifer means relaxing on the porch, enjoying the beautiful mountain view. Out riding with Rick and Jennifer. A picnic lunch at Brasstown Bald. Hey…we have cell phone service! Can we make it all the way to the top? In these motorcycle boots??? Getting silly after all those curvy roads. Out for more riding with Rick and Jennifer. Hay, what’s the hold-up? Rick and Jennifer’s cabin is not only comfy, but it has a beautiful view! Finally got to see their dogwood tree bloom. We also finally finished up the curtains for the man-cave, had many wonderful meals, and Spades! Alas, our week went too quickly…time to retire you two…hurry it up already! Right after our week with Rick and Jennifer, we headed over to Charlotte, to spend Easter weekend with my brother, his wife and family. We had a great weekend, which included fabulous food, great games, and some hiking to work off the calories. I’m going to group their return visit to us, over Memorial day Weekend, right here. It is so wonderful to get to have more time for family! Time with Bert, and Soher is always full of love and fun. Easter weekend with Bert and Soher, in Charlotte. We focused on seeing a few water falls, while Bert and Soher came to visit us. Anna Ruby Falls, Vogel State Park, and Helton Creek Falls, as well as…lots of good food. Anna Ruby Falls, with Bert and Soher. Helen, Georgia, with Bert and Soher. Hofers Bakery and Cafe for dinner and some take home desserts. I have to go back…they are closed! Helen, Georgia, with Bert and Soher. Relaxing after dinner in Helen, Georgia. Bert and Russ. FUDGE! Too many Jerky signs in this town! Helen, Georgia, with Bert and Soher. At trip anywhere near Blairsville, has to include food at Jim’s Smokin Que. Lunch at Jim’s Smokin Que, with Bert and Soher. Then onto Vogel State Park and Helton Creek Falls. Vogel State Park, with Bert and Soher. Helton Creek Falls, with Bert and Soher. View from Richard Russell Scenic Highway, with Bert and Soher. We spent a great day with John and Janet. Of course it started out with a quick lunch at Jim’s, but we took the adventure to Paradise Hill Vineyard, for a bottle of wine and great music on their patio. Then back to our campsite for dinner, which unfortunately did not include a camp fire because of the rain! John and Janet, at Paradise Hills Vineyard, Blairseville, Georgia. It’s nice having some retired friends around! 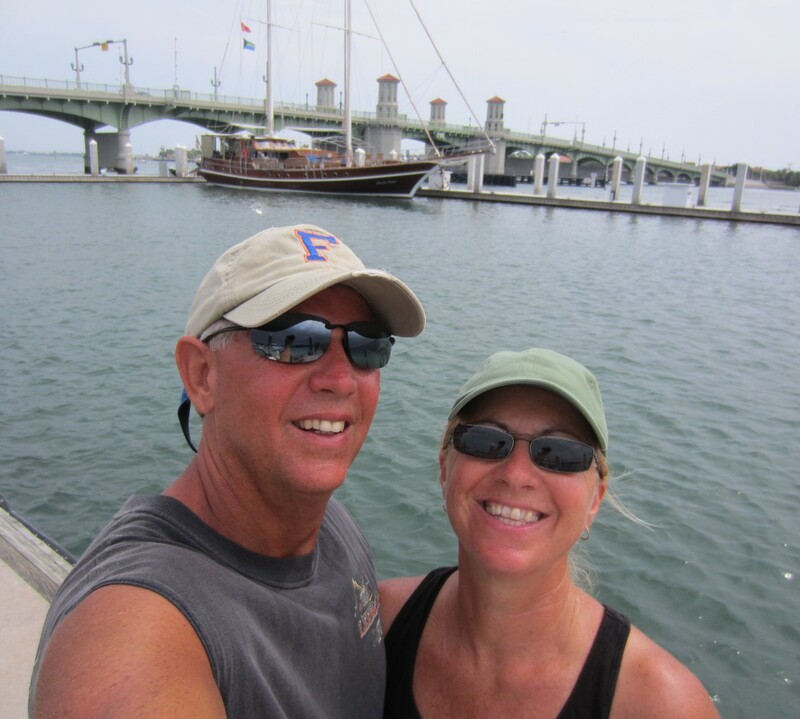 Gary and Debbie, whom we met in Marathon a few years ago, when they were sailing Aldeberon, have moved along to Hiawassee, Georgia. They build an adorable little retirement house and we enjoyed our visits. We really enjoyed the building project, because the “pay” was completed with fantastic gourmet meals prepared by Chef Debbie! Russ and Gary built steps and a deck to connect the driveway to the beautiful front porch. Completed front porch access deck. We all know that all work and no play…is just not fun, so we made sure we had lots of time to go out and explore, a few fire-side nights by the creek and plenty of hiking outings were fun for all. Hiking Brasstown Bald with Gary and Debbie. Hiking Amicalola Falls, with Gary and Debbie. Hiking Smithgall Woods State Park, with Gary and Debbie. We made fast friends with Bruce and Teri. It seems we have lots in common, their winter home is close to our place in Umatilla. They love motorcycle riding. They just love life! Shortly after they arrived from their winter home in the Villages, they began making preparations for the newest addition to their Paradise homestead. Their caboose arrived with much fanfare and activity. Finally by the end of the day, I spotted them relaxing in their chairs, admiring the caboose! Out for a beautiful ride. 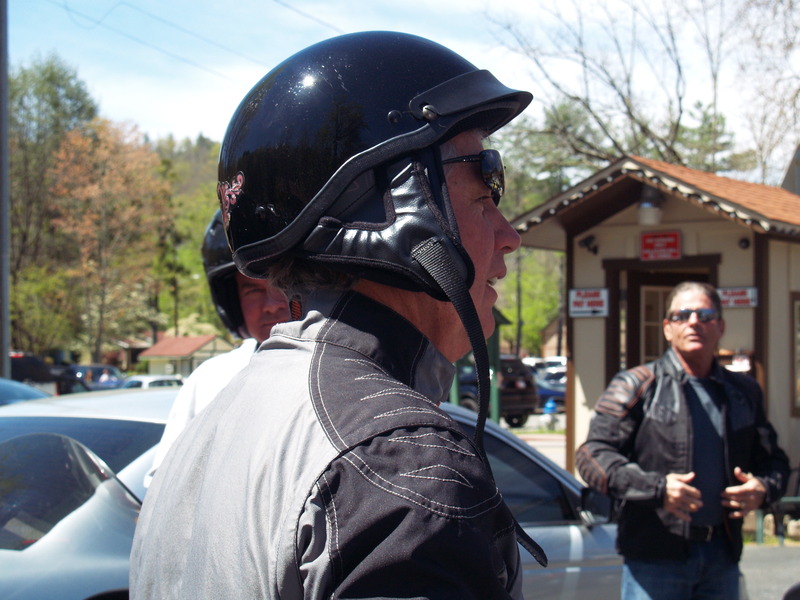 Riding the mountains in North Georgia, with Bruce and Terri. These two love-birds do this at the end of every ride! Love this…they do this at the end of all their rides. Sooo cute! We are always excited when we get to spend time with our family. Especially our California gang, who don’t get back to this coast as often as I want them too. Fortunately for us, Ray’s younger sister graduated from UF (Go Gators, Yeah Maggie!) We became part of the two week loop they did from Orlando, to South Florida, to Gainseville, to Georgia and then South Carolina! Wow, I’m tired for them. Nanny is ready for two little grands! Good morning Nanny. Is PopPop awake yet? Monta and Gabby visit Nanny and PopPop. Out for our first Hike, at Dukes Creek Falls, located on Richard Russell Scenic Highway. Hiking Dukes Creek Falls with Jennette, Ray, Monta and Gabby. There is never a dull moment with this guy! Nanny, I stacked the shoes by the door like you asked. Extra shoes make Nanny’s heart happy. Time for bed! Deep sigh, Nanny is tired! Sleeping in Nanny and PopPops camper with Thomas is the best. Day two, more hiking, at Smithgall Woods State Park, with fun in the creek! Hiking Smithgall Woods State Park with Jennette, Ray, Monta and Gabby. Having fun in the creek, under the covered bridge at Smithgall Woods State Park, with Jennette, Ray, Monta and Gabby. We made the best of a couple of rainy days. Babyland was a big hit, with an afternoon trip to Dahlonega. The Cleveland library had lots of games that were PhD approved by Dr. Daddy! I’m not sure I ever truly appreciated an inside playground this much! Thank you Chick-fil-A. A rainy day was meant to be spent at Babyland and holding newborn Cabbage Patch Dolls. Babyland, taking care of the Cabbage Patch Babies. I think she will fit, I can make her fit! An afternoon trip to Dahlonega, with a stop at the Cottage Vineyard and Winery. Lunch at Zaxby’s ana an afternoon in Dahlonega. PopPop, stick to the story line! Rainy days and Libraries with PhD approved games, and Chick-fil-A! Thanks for the indoor playground! Then just like that it was time for them to leave! Time for Nanny to cry! PopPop says don’t worry, I won’t let her cry for long! We loved our Georgia Mountain spring visit. Of course we have moved along and there are more adventures to come.